Salish Lodge, located among the western foothills of the Cascade Mountain Range, lies on a bluff atop magnificent Snoqualmie Falls, surrounded by lush green forest. Salish Lodge's idyllic outdoor setting makes it a wonderful place to visit when it's sunny and dry, while it's cozy rooms, spa, and indoor amenities make for a refreshing getaway even during cold and wet weather. Located in the small town of Snoqualmie, Salish Lodge is just 30 miles east of Seattle. Salish Lodge guest rooms come with many comforts and amenities to make your stay a refreshing experience. Furnished with contemporary Northwest decor, each room comes with a wood burning fireplace and a cozy seating area suitable for relaxing, reading, or staring out the window at the verdant view. A two-sided work table, large screen television with cable and movies on demand, coffee maker, and minifridge are other conveniences. 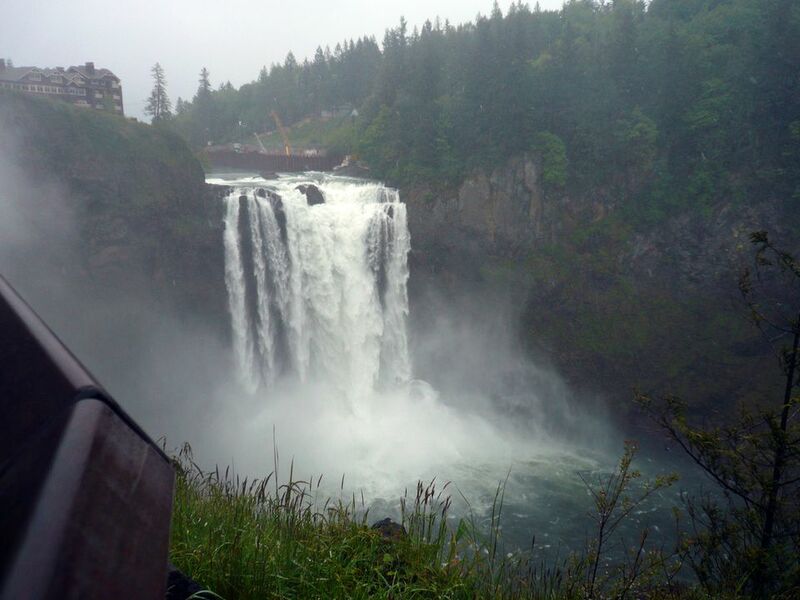 Salish Lodge's spacious corner suites come with Snoqualmie Falls views. Adding to the cozy and relaxing setting, each guest-room bathroom is equipped with a large jetted tub and shower. For a special treat, you can order one of the themed bath preparations from Salish's "Bath Butler" menu. Your bath-time options range from "Milk and Honey" to "Touch of Romance". Each bath comes with bath salts, exfoliator, and after-bath body butter. There's even a kid-friendly offering on the bath menu, complete with tub toy. After a day spent checking out Snoqualmie Falls, taking in a spa treatment, and savoring the incredible meals offered in the Dining Room, Salish Lodge makes sure you get a restful night's sleep. They offer a nice selection of pillow options, including buckwheat, lavender, memory foam, and more. Located just off the main lobby, this elegant yet comfortable library room includes seating areas, a game table (with games), and morning and afternoon coffee and tea service. Salish Lodge's large gift shop offers souvenir items, snacks and sundries, and a large selection of clever home decor and gift items. Aerobic equipment, free weights, and weight machines are available to guests in the third-floor Fitness Center. A variety of unique indoor and outdoor spaces at Salish Lodge are available for business meetings, weddings, and other special events. The Spa at Salish Lodge offers an extensive menu of spa treatments, with a number of unique services tailored to gentlemen and to expectant mothers. Your options include spa manicures and pedicures, skin care treatments, body scrubs and wraps, and massages. Your spa experience includes the opportunity to relax in one of the spa's mineral pools, steam room, or dry sauna; guests who choose to stay on Salish Lodges' Spa Club Level will enjoy extended hours to access these facilities. Open for breakfast, lunch, dinner, and weekend brunch, meals in the elegant Salish Dining Room come with incredible Snoqualmie Falls views or cozy spots by a wood fire. The fireplace is the same one that occupied the original 1919 Salish Lodge. For an extra special evening, reserve one of the Dining Room's private alcoves, which look out at Snoqualmie Falls and the misty forest canyon. The dining experience at Salish Lodge is famous for a number of reasons. Their bountiful Country Breakfast includes their signature buttermilk pancakes and steel-cut oatmeal along with pastries, eggs, breakfast meats, and specialty dishes. The lunch menu features gourmet soups, salads, sandwiches, burgers, and small plates. For dinner, the Dining Room menu offers many of the fresh food products that make Northwest cuisine so spectacular, including salmon and steelhead trout, local berries and mushrooms, and herbs grown on the property. Unique desserts and a 1000+ label wine list combine with the wonderful menu items, waterfall view, and elegant ambiance to create a truly memorable dining experience. Reservations are highly recommended. The Attic lounge's casual library-style decor, wood-burning fireplace, and gourmet food offerings entice you to settle in and relax in the company of good friends. Live music adds to the experience on Friday and Saturday nights. Room service dining is available through most of the day. As is common in the travel industry, the writer was provided with complimentary services for review purposes. While it has not influenced this review, TripSavvy.com believes in full disclosure of all potential conflicts of interest. For more information, see our Ethics Policy. You don't have to travel far to find hours of fun near Salish Lodge, particularly if you love the outdoors. Located adjacent to Salish Lodge, this small park contains charming landscaped walkways that lead to magnificent Snoqualmie Falls views. A gift and snack shop, picnic areas, restrooms, and interpretive panels are other park amenities. Salish Lodge guests can access a vast network of trails from the upper parking lot. Maps are available at the front desk, along with information about other local hiking trails such as Twin Falls State Park, Mount Si, and Tiger Mountain. Just a short drive away, this smoky casino offers fine and casual dining, entertainment, and endless gaming fun. Visitors to the Northwest Railway Museum, located in downtown Snoqualmie, can stretch their legs as they take a stroll through railroad history. The museum's collection of over 70 locomotives, passenger cars, and other railroad cars and equipment sits on tracks running beside Highway 202. Begin your visit at the charming old Snoqualmie Depot, where you'll find a gift and book shop, a few exhibits, and access to the Snoqualmie Valley Railroad, which offers weekend excursions.